If you want to compete at the college level, and possibly get a scholarship to do so, you have to do more than just practice, practice, practice (although that’s definitely required!). Here are some tips to remember and implement throughout high school. While this is in no means a full list of what to do, it will put you on the right track. This is absolutely crucial. While college recruiters will be looking for talented and dedicated gymnasts, they also factor in grades. Since schools require athletes to maintain a certain GPA to be eligible to compete, you don’t want them to worry about whether you can keep your grades up while also putting in a lot of hours at the gym. Make it easy on the recruiters – and yourself – and work to have a strong GPA. Remember, the top priority at school is academic performance! 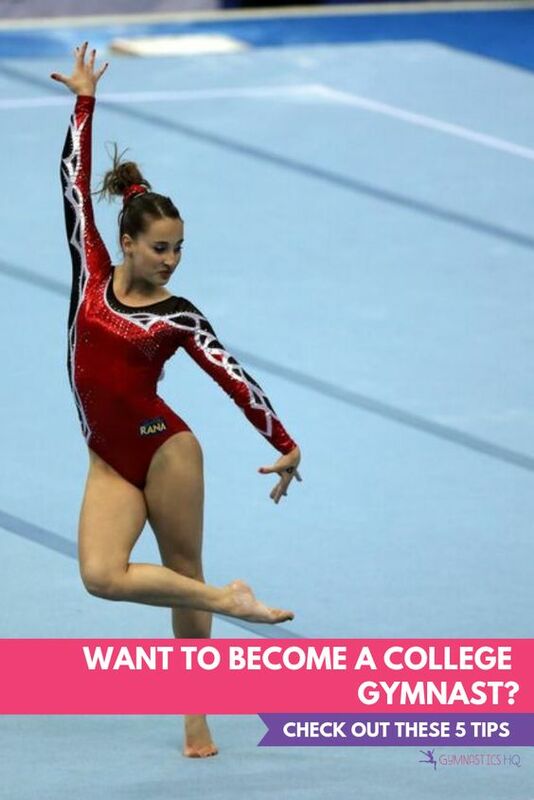 This is another MUST if you want to become a collegiate gymnast. While you may not always agree or even like your coach, you must always respect them. College coaches will absolutely talk to your coach about your attitude, discipline, strengths, weaknesses etc. and you want them to happily focus on your strengths and dedication to the sport. If a college coach hears that a gymnast frequently talks back or is disrespectful in any way, it will definitely give them pause. When you have a good attitude towards your coach, they will be much more inclined to promote you as a gymnast – and as a person – and help you reach your full potential. Make sure to record all of your scores from every meet in an easy and organized fashion. The recruiters will certainly be able to look up scores from important meets and will observe you in person; however, you will look more prepared if you can present them with a small binder or packet of the last season’s scores and awards. It’s also a good way for you to keep track of your progress and see what scores pop out to you. Even if you know vault is your weakest event, repeatedly seeing where you struggle in print can motivate you to improve in that area through extra drills or conditioning specific to that event. Make sure to videotape your meets and some clips from practice as well. It’s normally recommended to make a DVD you can send out to schools (like the youtube video below! ), but make sure you have footage from both competitions and practice sessions. This way they can see how you performed and what you’re currently working on. I would also recommend looking sharp in the practice sessions. I’m not saying put on make-up or buy a new leotard, but make sure you look well-groomed. While everyone involved in gymnastics knows that a 4 hour practice is tough on the hair, having your hair in a neat bun for those video-taped practice sessions will help everyone remain focused on your gymnastics—and not on the rat’s nest on top of your head. Every once in a while they show college gymnastics meets on TV, and every 4 years the Olympics are on TV. If you can, watch them so you can get an idea of what kind of skills the top performers are competing and what college teams standout to you. It will help you gauge where you are in the years leading up to your possible recruitment and what schools have strong gymnastics teams. It’s also great for motivation! I’d recommend recording them and watching them when you need an extra boost before practice or competition. Another great thing you can do is attend a College Gymnastics Camp over the summer. This will give you a chance to see the colleges up close and personal and give you more information about which programs you like better than others. 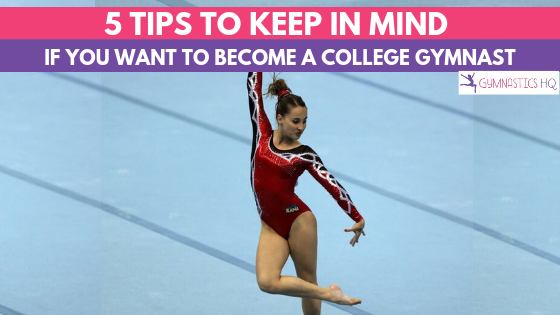 You might also want to check out 7 tips to help you set and achieve your goals, to think about setting and achieving the goal of becoming a college gymnast. Here is a college gymnastics recruitment video from youtube to get you thinking about everything you need to do to make your dream of competing gymnastics in college come true! We’re sorry to hear about your ankle injury. Bouncing back after an injury has a lot to do with your mental outlook so spend time daily imagining your ankle healing and seeing yourself getting back in the gym in your mind. Be patient! You’ll get there! !